Golden ears of the world, unite! While other people are happy with the incredible convenience that listening to MP3s and AACs on an iOS device offers—thousands of songs, anytime, anywhere—audiophiles decry the lower quality that comes as part of the bargain. If you crave sound quality on a par with (or even better than) a CD but still require the freedom that comes from carrying a bunch of music on your iPhone or iPad, it’s time to look at lossless audio. A quick compression primer: Lossy compression formats such as AAC and MP3 take up less storage space than standard CD audio does, but if you listen carefully you might notice that something is lost in translation. It’s usually the low-end and high-end frequencies that are sacrificed in the name of smaller file size. 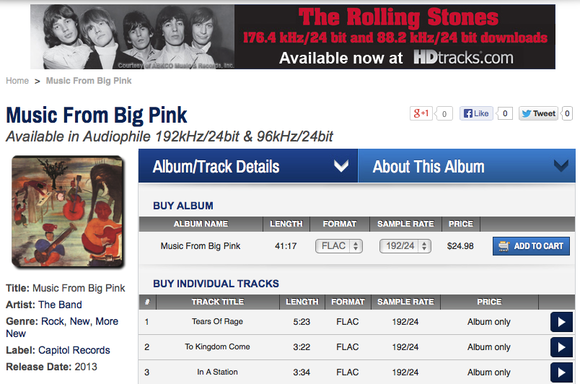 You can find lossless and high-resolution audio on HDTracks, band sites, and more. You could opt for uncompressed audio—AIFF or WAV files that are an exact copy of the song on a CD—but the files become so large (about 10MB per minute) that they make storage space a real concern. That’s where lossless compression comes in. 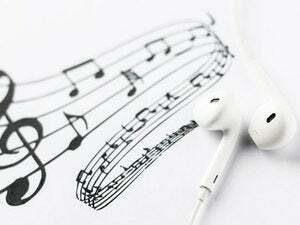 Lossless formats such as Apple Lossless Audio Codec (ALAC) and Free Lossless Audio Codec (FLAC) are still larger than MP3 and AAC formats, but they tilt the quality/size balance in favor of sound quality. In lossless compression, the codecs use algorithms that shrink the file size but allow the original to be reconstructed exactly. You end up with no quality loss, and lossless files are 40 percent to 60 percent the size of uncompressed CD files (still a fair bit larger than lossy MP3 or AAC files, though). Listening to lossless files on an iOS device can be seamless or may require a bit more effort, depending on your choice of lossless format. 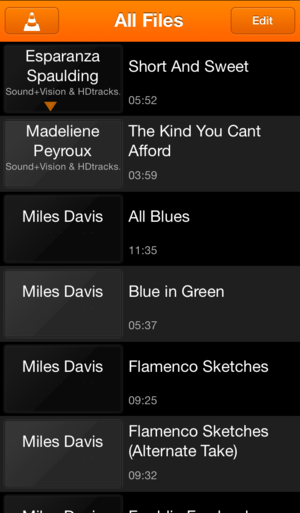 VLC for iOS brings FLAC playback to iOS devices for free. Apple’s Music app for iOS natively supports the company’s own ALAC format. To listen to ALAC files, just transfer them to your iOS device via iTunes, as you would with files downloaded from the iTunes Store or other music you’ve ripped to your computer. The files appear in the Music app with the rest of the music on your device. 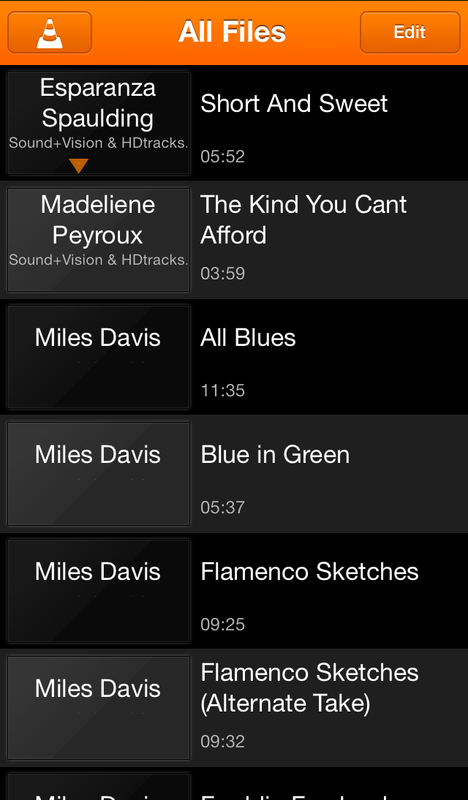 If you prefer FLAC—a common format for live and classical music downloads—you’ll need to download an app such as the free VLC 2.1 for iOS or Dan Leehr’s $10 iOS 7–only FLAC Player. Onkyo also recently released HF Player, a free EQ app that includes a $10 in-app purchase to enable FLAC and other high-resolution audio-file playback. With any of these apps, you’ll need to manually transfer the files to your iOS device. Connect the device to your Mac, launch iTunes, and select the device in iTunes’s source list on the left. Click the Apps tab and scroll down to the File Sharing section. Click the app you want to use, and drag your music files into the documents list to the right (or click the Add button to choose the files via the Finder). 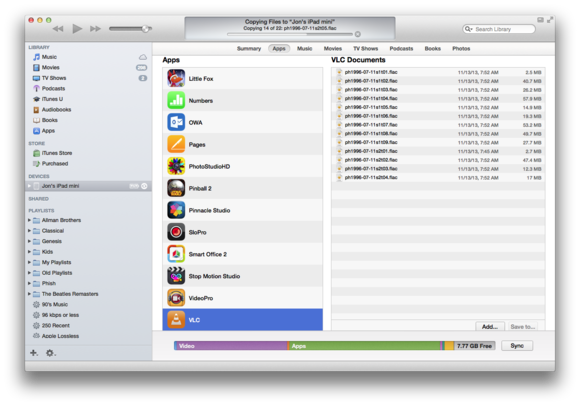 Your files will transfer immediately, and you should be able to play them through your selected app on your iOS device. (They won’t appear in the standard Music app.) Alternatively, you can stash files in Dropbox and then choose to open them in an app such as VLC, although you have to download and open each track individually. Drag your lossless files to your music app of choice in iTunes to add them instantly to your device. If CD quality isn’t good enough for your ears, you can raise the resolution even higher with lossless formats. With digital audio, analog sound waves need to be translated to digital information. The amount of raw information included in a file depends on both the bit depth and the sample rate. The bit depth describes how much data is used for each sample of audio: 16-bit audio offers 65,536 bits, while 24-bit audio captures 16.7 million bits. The more bits, the more accurately the digital signal approximates the analog signal it represents. A CD has 16 bits per sample, for example, while a Blu-ray DVD uses 24 bits per sample. Likewise, the sample rate indicates how often the analog sound wave, which is continuous, is sampled in a given time period. 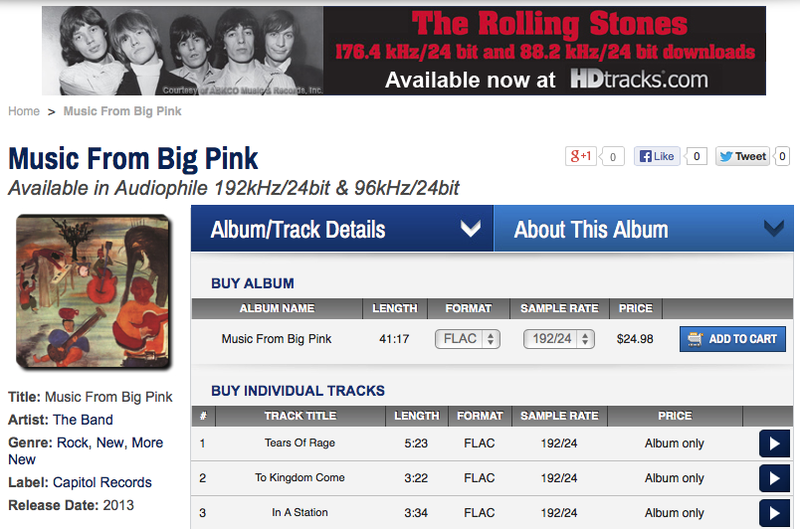 CDs use a 44.1-kHz sample rate; Blu-ray ups it to 48 kHz. But some files include sample rates of 96kHz or 192kHz—and some people believe the extra information makes a difference in how good the resulting audio sounds. Whether you can tell the difference depends on the equipment you’re using, how good your ears really are, and how good the source material is to begin with. 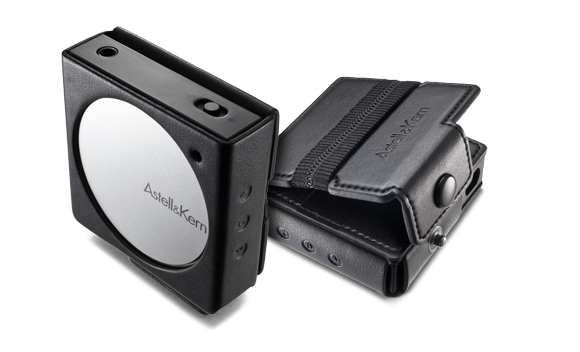 Astell & Kern’s AK10 is a portable DAC that works directly with Lightning-equipped iOS devices. Apps such as VLC for iOS and Onkyo HF Player can play high-resolution files, but there’s a catch: What you can hear on your iOS device is limited by its headphone jack, which is capable of reproducing only CD quality (16-bit, 44.1kHz). Even AirPlay is limited to CD-quality audio (although it can handle 24-bit and 48kHz for video). To unleash the fidelity of high-resolution audio files through your iOS device, you need a specially designed external digital-to-analog converter. Unfortunately, few DACs are designed to work with iOS devices. V-moda’s $598 Vamp Verza is one option; Astell & Kern will soon release the $300 AK10 portable DAC, which connects directly to your device’s Lightning port and enables 24-bit, 96kHz playback. Other USB DACs, such as Audio Engine’s $189 D3 24-bit DAC, aren’t made to connect directly, but you can use Apple’s $29 Lightning to USB Camera Adapter in between. It remains up for debate whether high-resolution audio makes any difference when you’re listening through headphones. If you’re using Apple’s stock EarPods or any basic headphones, you’re unlikely to detect the difference. But if you’re listening through a higher-end pair, you very well may be able to hear the extra bits and samples. Only your ears can say for sure.